Blaine Gabbert: Why do the Jacksonville Jaguars refuse to bench the league's worst quarterback? Blaine Gabbert: Why do the Jacksonville Jaguars refuse to bench the league’s worst quarterback? Why do the Jacksonville Jaguars refuse to bench the league’s worst quarterback? 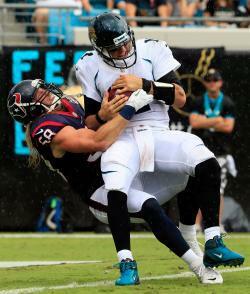 Blaine Gabbert of the Jacksonville Jaguars is sacked by Brooks Reed of the Houston Texans. Photo by Sam Greenwood/Getty Images. The Jacksonville Jaguars got some bad news yesterday when the Houston Texans thumped them, 27-7, at home. The news got worse today, when head coach Mike Mularkey announced that the injury Blaine Gabbert had sustained against Houston would not keep him from starting at Indianapolis this Sunday. Gabbert should not be playing, and that has nothing to do with his health. He is—until Brandon Weeden asserts otherwise—the league’s worst starting quarterback, and he drags down an otherwise good team by flailing about on the field. According to the Football Outsiders Almanac 2012, Gabbert’s rookie year, 2011, was the second-worst quarterbacking season of the last two decades, trailing only David Carr’s epic rookie stint for the expansion Texans. Last year, Gabbert was benched for a McCown. And it wasn’t even the good one. But let’s be fair to Gabbert. Even though this is his second year in the NFL, he’s the league’s second-youngest starting quarterback. He started only two seasons at Missouri before departing early and going to the Jags with the 10th overall pick. Perhaps he will develop footwork and accuracy and downfield vision with practice and seasoning. But there’s no need for his development to damn the entire team. Jacksonville has plenty of talent—Maurice Jones-Drew, Justin Blackmon, Laurent Robinson, Marcedes Lewis, an impressive front seven on defense—that shouldn’t have to wait for a callow quarterback to get it together. What Jacksonville needs is an average veteran who can run the offense until Gabbert’s ready, if he’s ever ready. They seem to have forgotten they have one on the roster. Jaguars backup Chad Henne is not respected, even though he should be. The Dolphins drafted him in 2008, and he backed up Chad Pennington during that one miraculous season when Pennington stayed healthy and the Dolphins made the playoffs. The next year, Pennington got hurt early and the Dolphins finished below .500. But Henne played well, going 7-6 after Pennington got the team off to an 0-3 start. While Pennington passed for 5.6 yards per attempt, Henne threw for 6.4. Henne completed 60.8 percent of his passes, which put him a tick below league average, even though he was throwing to the likes of Davone Bess, Greg Camarillo, and Ted Ginn. The next year, Henne improved further: 6.7 yards per attempt, a 61.4 completion percentage. In 2011, Henne played only four games—he separated his shoulder—but he increased his YPA to 7.8 while his completion percentage dipped slightly to 57.1. (I can explain that: The Dolphins had to play catch-up in all of Henne’s starts because their defense was so bad. It probably didn’t help that his starts were also the first four under a new offensive system.) All told, in his two full-ish seasons quarterbacking the Dolphins, Henne ranked 17th and 17th in Football Outsiders’ DYAR metric (defense-adjusted yards above replacement). That makes him passable, a level of performance that would make Jags fans plenty happy. But after all that solid quarterbacking and months of shoulder rehab, the Dolphins passed on Henne in favor of Ryan Tannehill, a converted wide receiver with 19 college starts. No matter: Henne headed to Jacksonville, where his only competition was one of the worst quarterbacks in league history. The Jaguars’ new blood—new coach! new owner!—would surely recognize Henne’s potential to be average, right? Apparently not. The Jaguars retained their old general manager, Gene Smith, the man who drafted Gabbert. So long as Smith’s still around, he’ll defer to Gabbert, because he doesn’t want to concede that he gave up two picks and $12 million for someone who can’t play. General managers treat their first-round quarterbacks as lottery tickets, players who, with just one big step forward, could become the next Brady, Rodgers, or Brees. The NFL is a passing league, and everyone wants to find the next passing sensation. Henne—who was drafted in the second round by a coach who’s been fired and a general manager who should be fired–carries no such cachet. No one thinks of him as a potential Pro Bowler, which is good, because he won’t be. But what he will be is Chad Henne, average quarterback. That’s not what any team wants, but it’s exactly what teams like the Jaguars desperately need.